Farm businesses looking at the looming deadline for Making Tax Digital (MTD) should concentrate on turning an imposition into an opportunity. Andrew Robinson, partner and head of agriculture at accountancy firm Armstrong Watson, said it was both a challenge and an opportunity. He said with the deadline of April 1 2019 approaching at a rapid pace, it was essential every business was fully prepared. Businesses will need to review their accounting software to ensure is compliant with the new regime. Mr Robinson said, at a minimum, this meant the business would need to process records in a digital form, preserve digital records in a digital form, create a VAT return from the digital records and provide HMRC with VAT data on a voluntary basis. 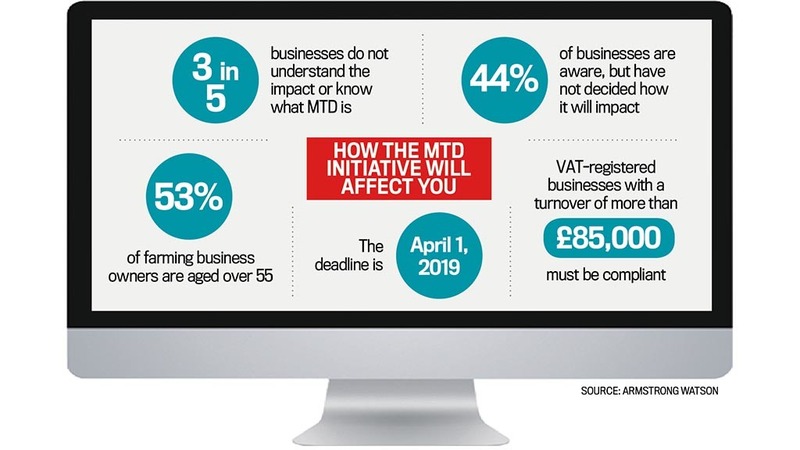 A common misconception was all UK VAT registered businesses needed to be compliant by April 2019, but only those with a turnover above £85,000 will need to keep digital records and submit VAT returns using MTD compatible software. However, those not covered would need to be in future, ‘likely by April 1 2020’, according to Zoe Keys at Ellacotts accountants. There was an exemption for a very small minority with more complex requirements, with their deadline delayed until October 1. And if this turnover dropped below the threshold after being required to comply, it still applied unless the business deregisters from VAT or meets exception criteria such as insolvency. “Digital means that records need to be maintained in a format which can be directly linked to HMRC when submitting VAT returns. “As spreadsheets and handwritten records are not classified as digital and will not be compliant, those bookkeeping on these systems will need to transfer to one of the software platforms recommended by HMRC." Another option was ‘bridging software’, which enabled data to be sent from spreadsheets to HMRC and Ms Keys said they were using this to enable clients to be MTD compliant whilst still using spreadsheets. And ‘splitting up’ the business to reduce the turnover so it falls below the threshold will not mean businesses will no longer need to be compliant. “Unfortunately, the enterprises will still have financial, economic and organisational links and therefore HMRC will identify this as one business,’ said Ms Keys. However, businesses can maintain separate records for each enterprise in order to track income and expenses accurately and to monitor profitability and should pick software which caters to their business. It was easy for farm businesses to look at making tax digital as a chore, but Promar’s farm business analyst Tryphena James urged businesses instead to look at it as an opportunity. Ms James also added there were particular challenges for the farming sector, with many still using paper-based systems now forced to move on to compliant software. She added continuously tracking finances, what a business owes or is owed, can help businesses keep better track of their cashflow. However, many still faced challenges such as poor or no internet connections and access to a computer. Andrew Robinson added there were many uses for the data, with businesses able to access up-to-date information all the time.